TPM and A3 Problem Solving is how you can solve problems, create plans, and gets things done. A3 problem solving gets its name from the A3 sized sheets of paper typically used to document the problem solving process and should be thought of as a way of structuring the conversation around problems and to guide that conversation through a logic path that provides the customer with improved systems, processes and products. Getting started with A3 problem solving and conducting A3 events in the context of a manufacturing environment involves cross functional participation and I typically try and integrate A3 into work flows that make sense to a particular organizations structures and culture, below is a work flow I developed when integrating A3 into the way problem solving was initiated a FMCG Packaging plant. The idea of having a work flow is to enables teams to understand roles and responsibilities through standardized training and also to help operators and their teams succeed by having everyone playing to position. The benefits of having a standard template begins with structuring the problem solving conversation and secondly continuous improvement. If we have a standard work book or sheet we can begin to improve our skills and success rates as we participate in the process and as capabilities grow, so do the requirements to have better systems and a demand is created to improve both the problem solving process and end results. 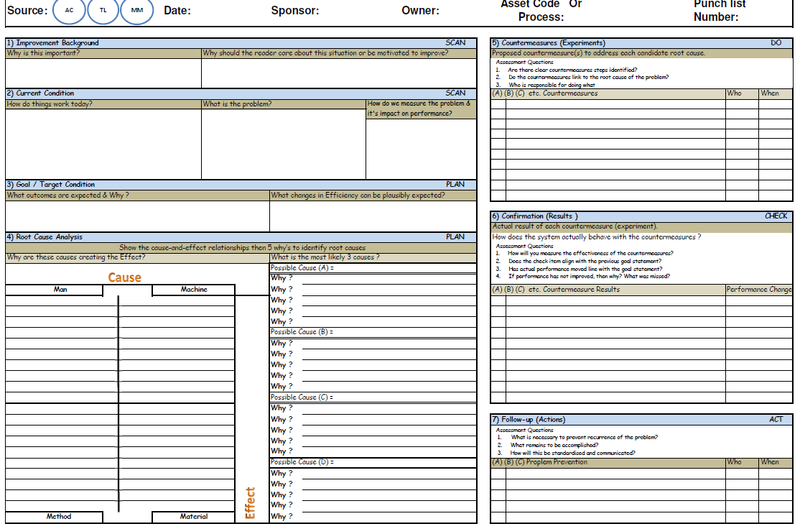 The Sheet below is a standardized format I developed along with the work flow above and integrated with the manufacturers meeting structures and culture, it became the approach of choice in a short period of time. 1) Improvement Background – What are some of the motivations and why should the business care ? 2) Current Condition – What are the measures or symptoms experienced and how will you measure improvement later ? 3) Target Condition – What will life be like if we remove the problem ? 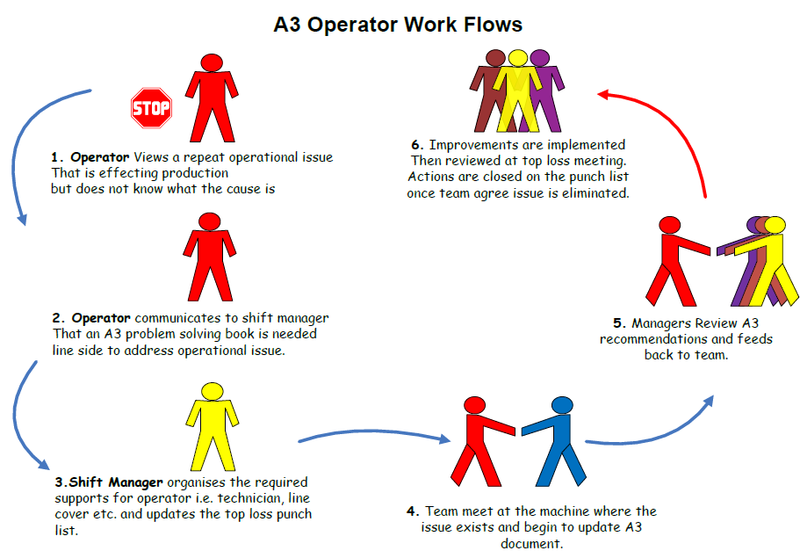 4) Root cause analysis – What are the most likely causes cross referencing the problem statement against the 4M’s Man Machine Method Material ? 5) Countermeasures – Can we verify that the proposed solution will deliver the desired result – try on a small scale and measure results ? 6) Confirmation – What happened when we tried a counter measure on a small scale, can we prove we are on the right track ? 7) Follow-up – Now that your on the right track , how do we keep the win and avoid recurrence ? Perhaps improved systems, business processes or training? Looking for low cost no cost solutions is a great place to start . We really hope you have found this article of value and that it has inspired you to learn more about TPM and A3 Problem Solving , just remember the hardest part of any journey is getting started but once begun you will learn it’s an enjoyable and rewarding experience that can improve your organization’s culture and performance in a very positive way.